Nature's Choice / Blog / Healthy Eating / Nuts About Nut Butter? Today, the market is brimming with hordes of different types of nut butters. This may make choosing your ideal nut butter seem overwhelming, and it’s very important to choose carefully. Considering the increasing popularity of these healthy goodies, manufacturers are trying to compete in the marketplace and are producing high volumes at low prices and we know what this can mean for the quality of the product. 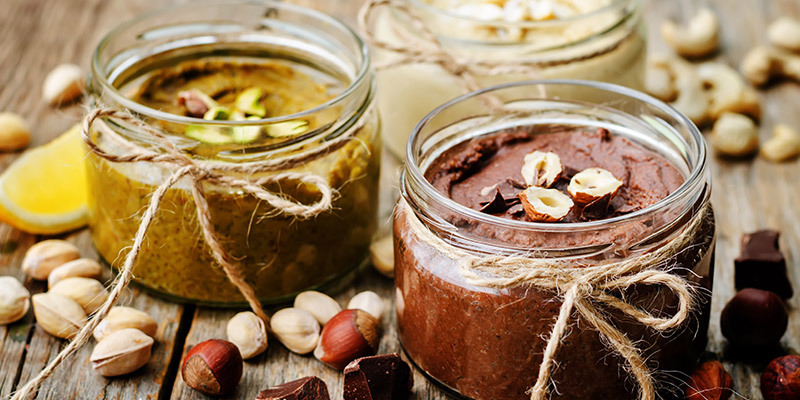 While many of these nut butters may taste great, many are loaded with additives like refined sugars and hydrogenated oils, which in turn lessen the heart-healthy benefits of the butters altogether. Resist the urge to indulge in these varieties and instead focus on using these simple tricks to figure out which natural butter is right for you. Regardless of your choice, be sure to choose brands with the fewest ingredients. Peanut butter is the most economical of the nut butters. Technically it’s not a nut, it’s a legume, it is the most popular nut butter available. Peanuts are a great source of heart-healthy monounsaturated fats that keep your cardio health in tip-top shape. Nature’s Choice peanut butter comes in two varieties, smooth and crunchy. This nut butter is slightly more expensive than others, however, it’s very popular right now with many people choosing to follow a low carbohydrate lifestyle. Almond butter is a great source of vitamin E which is an excellent antioxidant and helps to your keep skin looking healthy. Nature’s Choice uses the finest blanched Californian almonds that create a smooth and unique creamy finish. Cashew butter is also coming into popularity, it’s also more expensive, even more than almond butter. It’s rich in magnesium, which plays a crucial role in keeping your heart ticking and bones strong. Macadamia nuts are one of the only food sources that contain palmitoleic acid, a type of monounsaturated fatty acid that helps speed up fat metabolism, thus reducing the body’s ability to store fat. We are very lucky to have macadamia nut butter manufactured here in South Africa as it is generally more expensive overseas. It is by far the most delicious of our nut butters. Macadamia nut butter tastes amazing on whole grain toast, add sliced bananas on top and you have a killer healthy snack. It’s also just great on its own on a teaspoon as a healthy-fats-filled nutrient boost to get you through to lunch or dinner time. Taste and what you’re willing to pay for good food will determine the type of butter you choose. Whatever you choice is, rest assured that Nature’s Choice nut butters are free of junk and are simply delicious.